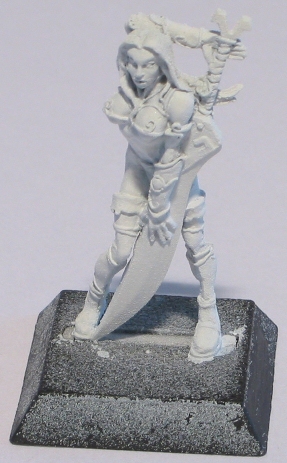 The model was undercoated with a Skull White Citadel Spraycan in two passes. Washes of diluted Skull White were used to get a clean white undercoat. Skin was basecoated with an equal mix of Bestial Brown and Dwarf Flesh. Skin was highlighted to Dwarf Flesh by using successive mixes of Bestial Brown and Dwarf Flesh. Skin was highlighted using successive mixes of Dwarf Flesh and Elf Flesh. All gold parts were painted in Bubonic Brown. Boots were painted in Scorched Brown, and laces in Snakebite Leather. Armor and braces were colored with Enchanted Blue. Boots were highlighted with successive mixes of Scorched Brown and Bleached Bone. Armor and braces were highlighted with successive mixes of Enchanted Blue and Skull White. The lightest color is about 3/4 of Skull White for 1/4 of Enchanted Blue. Pure Enchanted Blue was used as lining. The sword grip was first painted with a mix of 3/4 of Red Gore with 1/4 of Chaos Black. It was then highlighted with pure Red Gore, and finally with successive mixes of Read Gore and Bleached Bone. 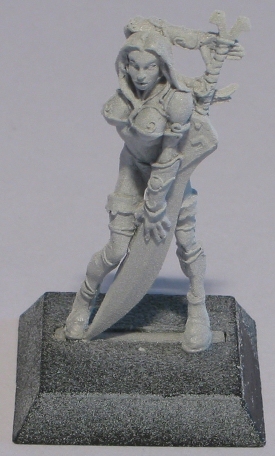 The sword blade was basecoated with Codex Grey, and highlighted with mixes of Codex Grey and Skull White. Light reflects were made using a color mixed from 9/10 of Skull White and 1/10 of Codex Grey. Shades were made using mixes of Codex Grey and Chaos Black. Bracers located on the arms were painted using the same color scheme. Hairs were basecoated with a mix of 1/2 of PA981 and 1/2 of PA982 (This color mix was stolen from Bragon). Rear clothes were painted in Chaos Black and highlighted with mixes of Chaos Black and Bleached Bone. Hairs were highlighted with successive mixes of the base color with Bleached Bone. Gold parts were highlighted with successive mixes of Bubonic Brown and Skull White. Shading was made with a mix of Bubonic Brown and Chaos Black. Gem was painted in Chaos Black, then highlighted with a mix of Chaos Black and Red Gore. Pure Red Gore was used in the center, then a mix of Fiery Orange and Red Gore was used to highlight the upper corner. Pure Fiery Orange and pure Skull White were painted on the top of the gem to draw light reflect. Laces were highlighted with successive mixes of Snakebite Leather and Bleached Bone. Scorched Brown was used to draw eyebrows and eyes. Sand was glued on the base using PVA. It was first painted with Brown Ink, then drybrushed with Snakebite Leather. A last drybrush of Bleached Bone was used to hilghlight the sand. Flock was glued on the painted sand using PVA. Base sides were painted with two coat of Goblin Green. 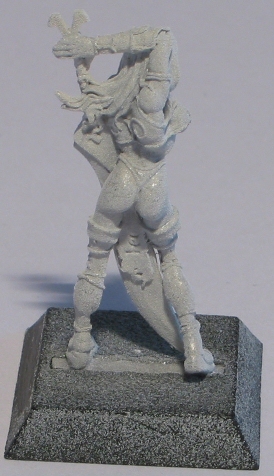 Two coats of GW Purity Seal was used to protect the model against battlefield damages.